Innovative practices are closely connected with our school mission. which is interesting and attractive for students, teachers and parents”. 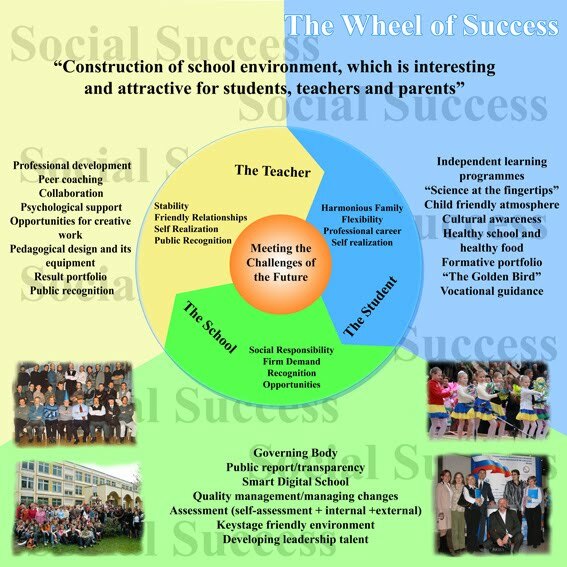 The school vision is: “Creating the system of motives and motivations for students and their families, school staff, which can make the process and results of education attractive for the participants and increase the quality of the teaching and learning process by 10-20%”. School core aim 1 – for all learners to improve their academic achievements, which leads to academic success. School core aim 3 – For all learners to improve their readiness for today’s job market. As a result of the implementation of previous educational programmes there are o lot of necessary methodical, information, management recourses in our Centre, which enable us to achieve the main aim – to create a school, where it is interesting to be for children, parents and teachers. We define innovation as a complicated process, which can be understood as a chain of interconnected and consciously initiated changes, considered to be the result of a certain socially important creation act which is implemented in a real educational practice to satisfy already existing or new, recently appeared demands. Optimization of educational net resources to welfare the students, teachers and parents to take part in the management of the Centre. Achievement of the social success by all members of the educational process in our school and its community. All these give the school an opportunity to work in the innovation conditions for more than 20 years. Now we are looking forward to learning the opinion of an external party from other countries. We are eager to make strong connections with leading schools and educators from around the world, and participate in global dialogue about education for the future. We are ready to develop relationships with innovative schools all over the world and share best practice with them.